Lately, there has been an explosion of new, “smart” devices for your home from companies like Google, Amazon, Philips, Lutron and others. You can control your music, order a pizza, adjust your thermostat, set your lighting and more with your smart phone or by voice control (with the appropriate device). And, cloud-based technology now allows you to monitor your Las Vegas, NV home using your smart phone from anywhere in the world – check your security cameras, adjust your heating or cooling system and even keep tabs on your energy consumption. Convenience aside, these devices can make your home more comfortable, safer, healthier and even reduce your utility bills. If you’re interested in new WIFI devices for your home, but don’t know where to start, consult the expert HVAC techs at Sahara Air Conditioning & Heating. Our team is up-to-date and trained on the latest technologies and products, and can help you find the right system for your home and budget. Sahara Air Conditioning & Heating has been a “smart home” leader in Las Vegas, bringing wireless and programmable technology into our customers’ homes since the beginning. In fact, we’re one of only two Nest Pro Dealers in all of Las Vegas, and have been installing Nest products and WIFI enabled thermostats, cameras and smoke detectors for years. Call the expert HVAC techs at Sahara Air Conditioning & Heating when you have questions about how “Alexa” or “Siri” can help you manage your modern, connected home. Google Home – Google Home is a voice-activated speaker powered by the Google Assistant. Ask it questions. Tell it to do things. It’s your own Google, always ready to help. Just start with, “Ok Google”. 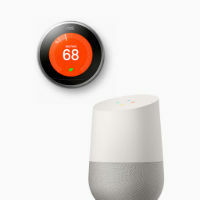 In addition to controlling your music, answering questions and just being your personal assistant, Google Home also works seamlessly with smart devices from Google, like Chromecast and Nest, and your Philips Hue (to control you home’s lighting). Learn more about Google Home. 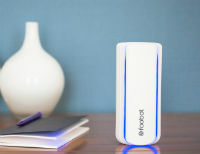 Foobot – We spend a lot of time indoors, and better quality indoor air can improve both your health and sleep. With the proper filtration you can breathe easier, reduce allergies, remediate mold and be less fatigued. Foobot is an air quality monitor for your home that works with your Nest Thermostat, Amazon Echo, Ecobee thermostat and many others. It automatically controls your devices, and makes the air you breathe healthier and more pure. If you’re interested in improving the quality of the air you and your family breathe, give the expert HVAC techs at Sahara Air Conditioning & Heating a call today. Learn more about Foobot. If you’re interested in learning more about smart home products, or how you can integrate these devices into your existing system, give the HVAC experts at Sahara Air Conditioning & Heating a call at 702-796-9677.